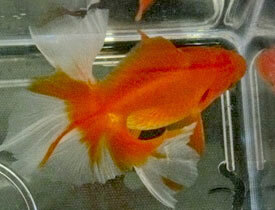 This fish has an incompletely divided double tail, with the tail splayed sideways and forwards. 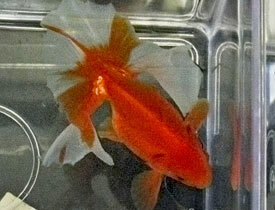 It was developed in Japan from the ryukin, and is uncommon outside Japan. 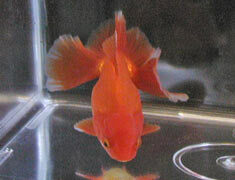 Tosakins were bred for viewing from above, and much of the effect of the spectacular tail is lost when viewed from the side. 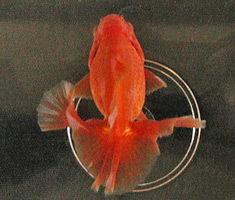 This is the only recognized goldfish variety with an incompletely divided double tail: the two layers of the tail are split apart and grow separately from each other but are joined along the top edge (although, in that the tail is splayed sideways, it no longer appears to have a conventional top edge). 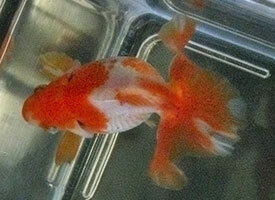 See Background Information for an explanation of goldfish finnage. 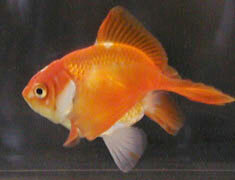 The fish should be bright and alert. 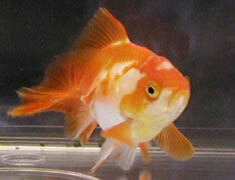 The body should be short and rounded with the head being long and pointed. The caudal fin should be joined and should be at least 75% of the length of the body with the extremities being scalloped shaped. The caudal rays should have the strength to hold a good pan-shaped contour with the upper lobes turning initially forwards towards the fish’s head, thereafter turning down and backwards with the leading edges of the lobes finishing in line with the peduncle. 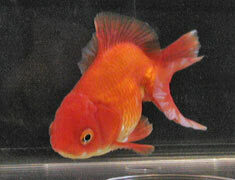 Metallic fish should be self-coloured (red, orange, yellow, blue, brown or black) or variegated (any combination of these colours including white in a pleasing pattern similar on each side). 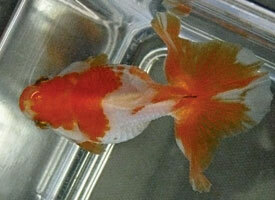 Good quality fish will have high colour intensity and metallic shine extending into the fins. Calico fish should have a blue background with patches of violet, red, orange, yellow, brown and white, spotted with black. Fish should have a high intensity of colour evenly distributed over the body, with colour, especially black, extending into the fins. Adult tosakin with well developed tail. Photographed at GSGB 2009. 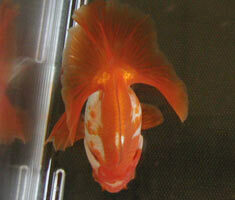 Young adult red-white variegated tosakin, shown at GSGB 2005. 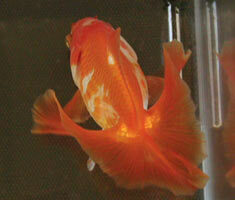 Young adult red-white variegated tosakin, shown at GSGB 2009. 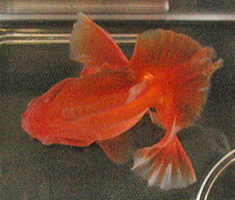 Young adult red tosakin, shown at GSGB 2005.